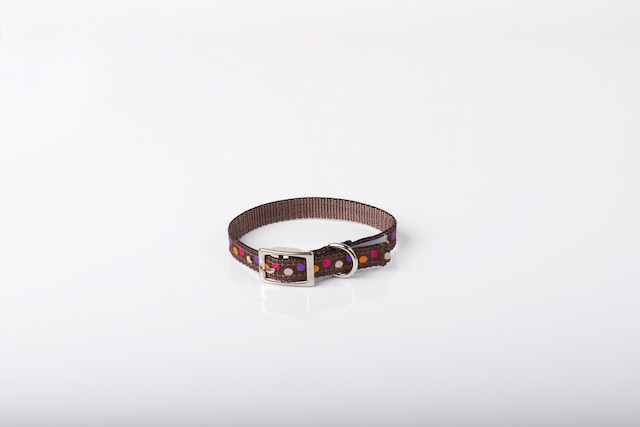 The SMD Ozzies Orbits designer collar is beautifully constructed, made of durable 100% nylon webbing, and the ribbon is woven with 100% polyester thread. The Petite design is slightly different than the Small and Medium/Large options though equally colorful. Fashion should be easy to maintain: wash our collars and leashes on delicate and lay flat to air dry. SIZE INFORMATION: Our Petite fashions fit dogs up to 11 lbs. Petite collars measure 1/2 inch wide by 12 inches long. When buckled, the approximate circumference is 7.25 inches to 11 inches. Our Small fashions fit dogs up to 30 lbs. Small collars measure 3/4 inch wide by 17 inches long. When buckled, the approximate circumference is 10.75 inches to 14.75 inches. Our Medium/Large fashions fit dogs up to 45 lbs. Medium collars measure 1 inch wide by 20 inches long. When buckled, the approximate circumference is 13 inches to 18 inches. Large collars measure 1 inch wide by 25 inches long. When buckled, the approximate circumference is 21 inches to 23 inches. Quick Tip: to measure your dog's neck, take a piece of string and wrap it around their neck where a collar should go. Mark the string, then lay it flat and measure it. That is the circumference of your dog's neck. Of course, tape measures work too!